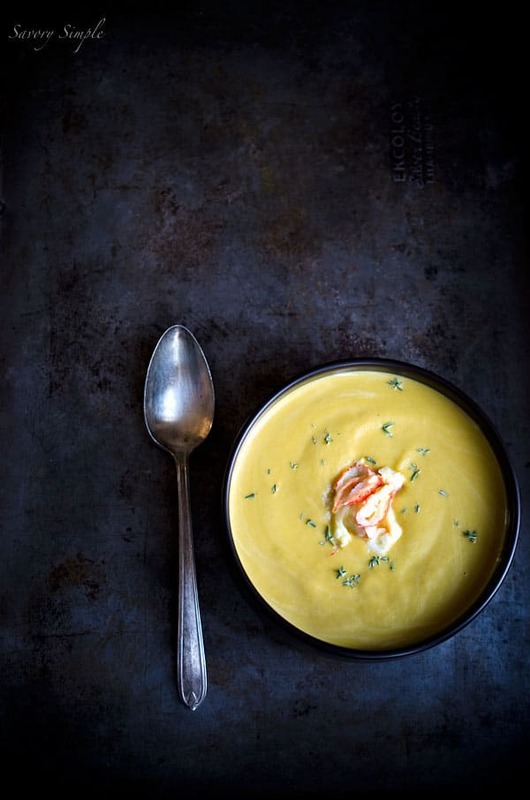 This Butternut Lobster Bisque is an elegant, seasonal delight that is simple to prepare at home. It’s especially perfect for a romantic dinner for two. I really love shellfish. Crab, lobster, mussels, shrimp, all of it. But sometimes I find it a real hassle to prepare. Maybe I’m just lazy? When it comes to lobster and crabmeat I prefer just buying the meat already cooked from local seafood markets. 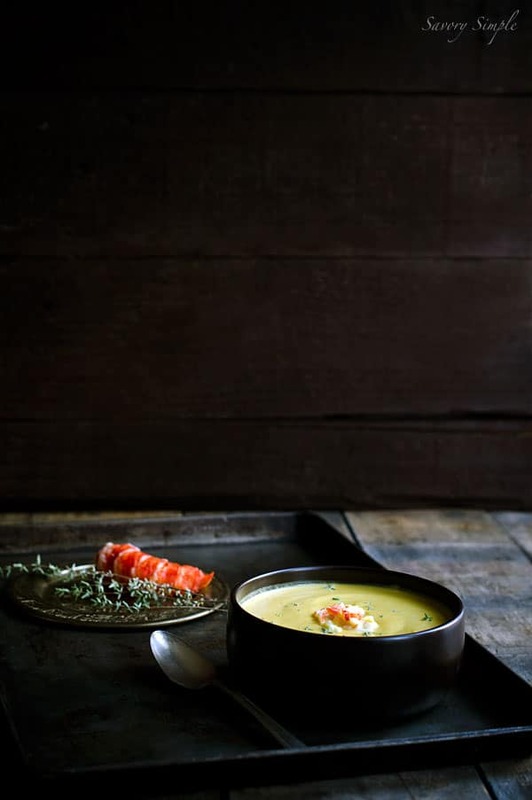 I’m lucky enough to have several options near me and when I recently saw fresh cooked lobster meat I immediately knew I wanted to make a bisque. Seafood bisque is just pure joy to me. And what better way to enjoy it right now than with sweet, creamy butternut squash? 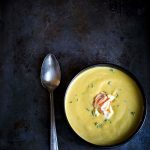 Most bisque recipes use heavy cream and you can certainly use it in this recipe but I find that the pureed butternut squash is thick and creamy enough that you can get away with using half and half or even regular milk and it will still have that rich, silky texture one expects in a cream soup. The recipe also calls for fish stock, which I realize might be a pain for some of you who don’t like making homemade stocks. I found a local butcher shop near me that carries homemade fish stock but it’s really not difficult to make. For this recipe you could use fish stock, shrimp stock or lobster stock. And if all of that sounds complicated and bothersome to you, use chicken stock. The bisque itself won’t have the same seafood flavor but it will still be delicious and will work well with the lobster meat. This is, beyond a doubt, my new favorite soup recipe on the blog. I wish I had a big bowl of it in front of me right now! 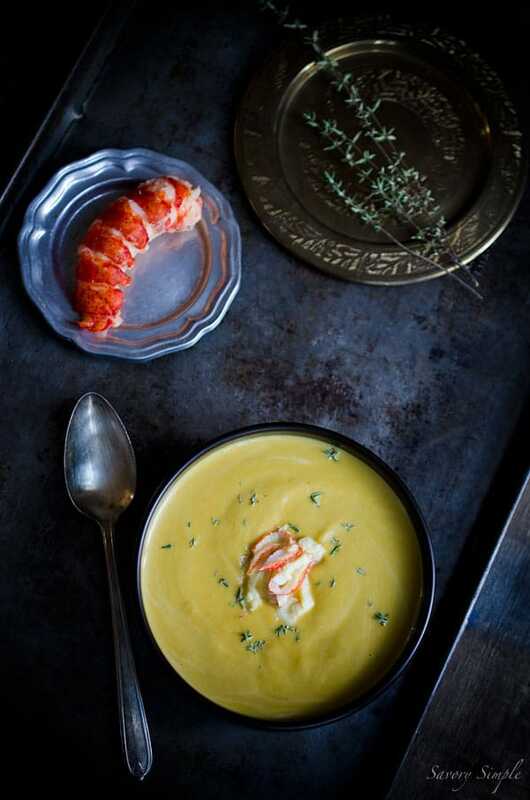 This Butternut Lobster Bisque is an elegant, seasonal delight that is simple to prepare at home. Heat the olive oil in a dutch oven or large heavy-bottom saucepan over low heat. Add the leeks, shallot and celery with a pinch of salt. Allow the vegetables to sweat for several minutes, stirring periodically, until softened. Add the butternut squash and cook for several more minutes, stirring. Turn the heat up to medium and allow a brown glaze to slowly build on the bottom of the pan by stirring less often. Keep an eye on it to make sure it doesn't burn. Use a spatula to scrape up and incorporate the brown bits a few times. After several minutes, add 1/3 cup cognac to deglaze the pan and loosen the rest of the brown bits. Allow to alcohol to reduce down to almost nothing, stirring the vegetables frequently, and then add the fish stock and thyme leaves. Bring the liquid to a boil and then cover the pot and reduce the heat to low. Allow the soup to simmer for 45 minutes. Carefully transfer the soup to a blender and puree until very smooth. Wipe down the dutch oven and return the soup to the pot. Stir in the half and half, 1 tablespoon cognac, and the salt, pepper and cayenne. Add the lobster meat, optionally reserving some for garnish. Serve hot. To reheat the soup, strain out the lobster meat first to avoid overcooking it. Add it back in once the soup is hot. Can you say creamy deliciousness??? OMG you had me at lobster! My favorite seafood but is a treat. And I love the extra punch of veggies in here!